The recent loss of our beloved cat Sherman has me looking with new eyes at the many things Gretchen and I view as being important in life. Not all aspects of life contribute equally to our emotional well-being and it feels like it’s time to reassess the relative importance of things we have against the things we do and the actions we share with others. We have worked hard over many years to acquire the skills that will enable us to earn a living under many different circumstances. These skills and their use to help others seem to be of paramount importance in a continually changing world where passive investments or government programs may not be able to help us now or in years to come. At the same time, we learned that working in an environment that provides income at the cost of personal integrity and sanity is a losing game. We decided that whatever we do to earn a living must be something that enhances our lives rather than drains it of meaning. The accumulation of things, like clothes, shelter, vehicles is only important as far as these things provide a working framework in which to get on with life and share it with others. Too few things and one’s attention is stuck on the grim necessity of surviving on a day to day basis. Too many things and one’s attention is stuck on protecting it all from loss and not enough attention is available for living. 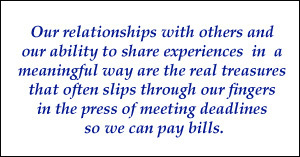 Our relationships with others and our ability to share experiences in a meaningful way are the real treasures that often slips through our fingers in the press of meeting deadlines so we can pay bills. We need to deliberately chart our course in life so that we create time to share moments with family, friends, pets and others who fill our lives with joy or inspire us. At the end of the year do we remember the satisfaction meeting deadlines or of paying our bills? Perhaps. But it is far more likely that we look back fondly on those few golden moments when we shared a moment of understanding and we communicated in a way that increased our affinity for someone. Those moments are what make life worthwhile. If we have none to look back on, we have a barren and lonely existence. If we have many of them, our capacity for facing the future is enormously enhanced. Care for and treasure those who enhance our lives. Put those relationships at the very top of the list of things to do every day and life will be a lot happier and we will probably be more productive. Our attention will be on the things that are really needed by ourselves and those we care for. Building strong relationships with those people, pets, plants and other living things that share our lives is more productive and more pro-survival than merely accumulating things and eating well. All of these are necessary, but maintaining the correct balance is vital. This entry was posted in Possibly Helpful Advice, Simpler Lifestyle and tagged relationships more important than things, skills to earn a living, treasure those who enhance our lives. Bookmark the permalink.